Dom Ball and Jake Mulraney square up as Sean Clare (bottom right) is grounded. Aberdeen and Hearts have been cited by the Scottish FA after the melee towards the end of Saturday’s game at Tynecastle. 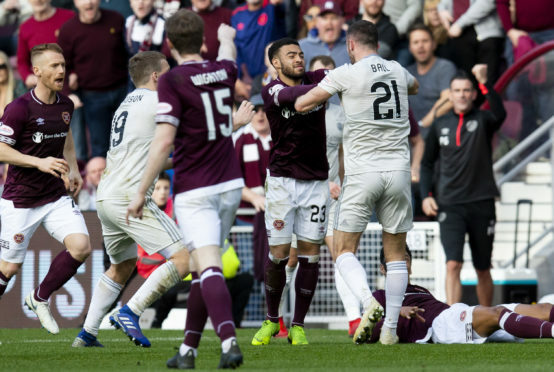 Dons defender Dominic Ball was involved in an altercation with Hearts forward Sean Clare, which sparked a confrontation involving players from both sides. Four players were booked – Ball, Lewis Ferguson, Arnaud Djoum and John Souttar – by referee John Beaton, as Hearts held out for a 2-1 win. Both clubs have been charged with breaching disciplinary rule 204 – where three or more players/members of staff are involved in a confrontation with players or staff from the opposing team. They have until Wednesday April 10 to respond, with a principal hearing date of Thursday April 25. 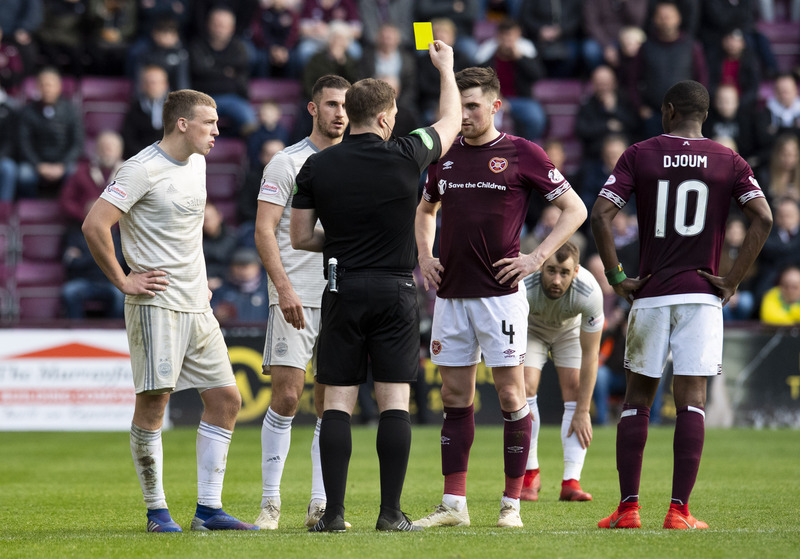 Referee John Beaton shows yellow cards to Aberdeen’s Lewis Ferguson (left), Dom Ball (second from left), Hearts’ John Souttar and Arnaud Djoum.